Add features from third-party services to Webex Teams or perform actions on behalf of another user with Integrations. 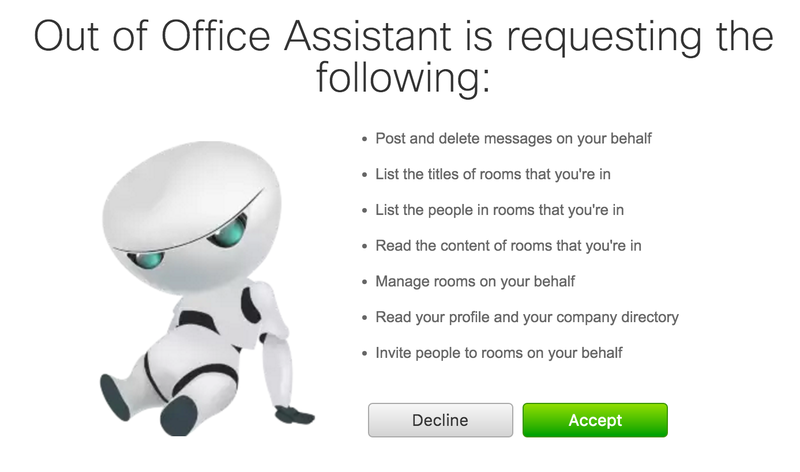 Integrations are how you request permission to invoke the Webex REST API on behalf of another Webex Teams user. To do this in a secure way the API supports the OAuth 2 standard which allows third-party integrations to get a temporary access token for authenticating API calls instead of asking users for their password. Registering an integration with Webex Teams is super easy. If you're logged in, select My Webex Teams Apps from the menu under your avatar at the top of this page, click "Create a New App" then "Create an Integration" to start the wizard. You'll need to provide some basic information like your integration's name, description, and logo. This information should be user-facing since that's what they'll see in the permission dialog. After successful registration you'll be taken to a different screen containing your integration's newly created Client ID and Client Secret. The Client Secret will only be shown once so please copy and keep it safe! This step requires that your integration have a user interface capable of temporarily sending users to a Webex login page. For web apps this is typically done as a popup or redirect. For mobile apps consider using a "WebView" or equivalent on your mobile platform of choice. response_type Must be set to "code"
Scopes define the level of access that your integration requires. The following is a complete list of scopes and their user-facing descriptions as shown in the permission dialog. Scopes that begin with spark-admin can only be used by users with administrative access to their organization. Requesting these scopes during a grant flow will not give non-admin users access to administrative functions. The spark:all scope acts as an overall aggregate for the rest of the user scopes. It requests full access to a Webex Teams account. It does not include any spark-admin scope privileges, which may be added if necessary. This special scope allows your application to behave as a native Webex Teams client, providing access to all privileges for a Webex Teams account. Applications that use the Webex Teams SDKs to enable calling features will require the spark:all scope. As a general best practice, your integration should request only the scope, or scopes, it needs. For example, if you are creating an integration that notifies users of updates in a third-party service, and never responds to any commands, we recommend using only the spark:messages_write scope. The state parameter is used to verify that the response from grant flow has not been tampered with along the way. It is recommended that your integration set this to a value that is verifiable once the user gives permission and the web browser is sent to your redirect_uri. A second use for this parameter is to encode basic state information like an internal user ID or the URL of the last page they were on before entering the grant flow. Your integration will then need to exchange this authorization code for an access token that can be used to invoke the APIs. To do this your app will need to perform an HTTP POST to the following URL with a standard set of OAuth parameters. This endpoint will only accept a message body encoded with the application/x-www-form-urlencoded content type. grant_type This should be set to "authorization_code"
"description": "The request requires a valid access token set in the Authorization request header." At this point, you should use the refresh token to generate a new access token from the authorization server. Using access tokens that are short-lived and requiring that they periodically be refreshed helps to keep data secure. If the access token is ever compromised, the attacker will have a limited time in which to use it. If a refresh token is compromised, it is useless to the attacker because the client ID and secret are also required to obtain a new access token. grant_type This should be set to "refresh_token"
The Webex REST API will then respond with JSON containing a new access token. Generating a new access token automatically renews the lifetime of your refresh token. Refreshing an access token before its expiration date will not cause the original access token to expire. "description": "The refresh token provided is expired, revoked, malformed, or invalid." The Bearer part is important as it instructs the API that this is an OAuth token instead of HTTP Basic Auth.